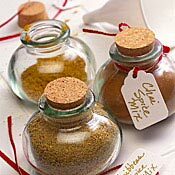 RECIPE TITLE "Caribbean Spice Mix Recipe"
Inspired by the spicy-sweet mix of seasonings found in Caribbean-style cooking, these recipes will add some sizzle to your summer cookout. With the right spices, you can create your own special blend. Keep it on hand for seasoning all sorts of dishes this summer. Ground ginger, black pepper, dried orange peel, mace, cloves and brown sugar offer the right amount of heat and sweetness. Rub on chicken or pork or toss with prawns. Store in airtight jars or tins in a cool, dark place for up to two months. Recipe reprinted by permission of Fine Cooking Magazine. All rights reserved.